Jazz: A Film By Ken Burns is a documentary miniseries directed by Ken Burns. Jazz is the last in a trilogy by Burns, following The Civil War and Baseball. It was broadcast on PBS in 2001, and was released on DVD later that year by the same company. The film concerns the history of jazz music in the USA, from its origins at the turn of the twentieth century through to the present day. It is narrated by Keith David, and features interviews with present-day musicians and critics such as trumpeter Wynton Marsalis (also the artistic director and co-producer of Jazz) and noted critics Gary Giddins and Stanley Crouch. Music critic and African-American historian Gerald Early was also a consultant. Jazz is the longest jazz documentary yet produced, and it is rich in musical examples and classic, rare and unseen footage. 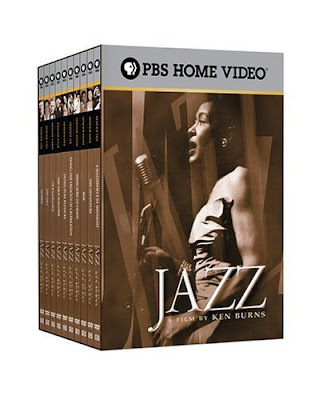 Visually, Jazz is very much in the same style as Ken Burns' previous works: panning and zooming shots of photographs are mixed with period movie sequences, accompanied by music of, and commentary on, the period being examined. Between these sequences, present-day jazz figures provide anecdotes and explain the defining features of the major musicians' styles. Duke Ellington's Lazy Rhapsody (1932) is a recurring motif at the opening and closing of individual episodes of the series. The documentary focuses on a number of major musicians: Louis Armstrong and Duke Ellington are the central figures, "providing the narrative thread around which the stories of other major figures turn", among them Sidney Bechet, Stan Levey, Count Basie, Benny Goodman, Billie Holiday, Charlie Parker, Miles Davis and John Coltrane.